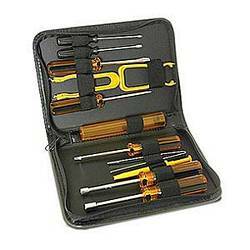 This tool kit can handle basic maintenance needs with multiple screwdrivers, a chip extractor, a three-clawed part holder and tweezers, all contained in a lightweight zippered vinyl case. Pros: *Good organization. *I really like the hex drivers. A lot. Cons: The screw holder cylinder is cracking near the top where the cap goes on. I would have liked to see another material used to prevent the cracking, and I am afraid to keep using it as it may start to split the rest of the tube if I use it as much as I do, so I use it to hold essential screws, and I store any removed screws from a computer in a separate container.